The academy is dedicated to the encouragement and support of educators who invest time, energy, and capital to create, develop, and market programs, products, services, or technologies designed to enhance and improve education while simultaneously working with schools and colleges to insure the learning, practical application and appreciation of the skills and values of the entrepreneur by students they serve. 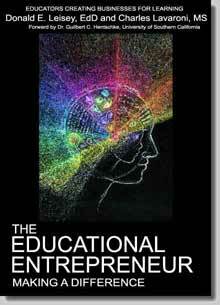 Dr. Don Leisey and Charles Lavaroni, founders of the academy, have written a book titled The Educational Entrepreneur: Making a Difference that chronicles the lives of twenty-two educators who have built successful businesses to improve learning. These former teachers and school administrators all took personal risks to enhance education. Each one of their stories is profoundly inspiring. The International Academy for Educational Entrepreneurship is proud to name Kristen M. Cauz, MS, of San Rafael, California as the 2017 Educational Entrepreneur of the Year for her achievements, leadership, and success as an Educational Entrepreneur. Kristen Cauz is passionate about her role as an educator and her business, A+ Creative Tutoring that she created in 2001. Ms. Cauz holds a Bachelor's Degree in Sociology from the University of California at Santa Barbara in 1989, and studied abroad at the University of Edinburgh in Scotland during her Junior Year. 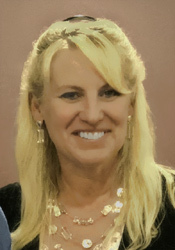 She holds a Master's Degree in Educational Leadership and California Multiple Subject Teaching Credential from National University in San Diego in 1991, and did advanced study in School Administration and received a California School Administrative Credential from the University of San Francisco in 1995. She also holds a Nevada Multiple Subject Teaching Credential and attended a Spanish Immersion Program in Cuernavaca, Mexico during the summer of 1991. Kristen Cauz, an innovative teacher, began her teaching career in third grade in 1991, in a remote, low income, desert area in Nevada close to Lake Tahoe where she was living. She incorporated into her teaching, many hands on, innovative learning experiences in her classroom to give the students opportunities to understand a world beyond the desert community where they lived. One project involved designing a "classroom rainforest" including layers of plants, humidifiers and jungle sounds to give students a chance to explore climate and factors affecting the environment. This project was recognized in local newspapers and became a popular kit she sold to teachers for use in their classrooms. She also designed conversion kits used for other units of study such as the Solar System. Kristen, moved on to teach second grade in the Carson City, Nevada School District, where her school was involved in a program that was admired and renowned throughout the USA for its progressive educational practices and model. In 1993, she won several teaching recognitions and competed against women from different professions who were creating change in the world. She won the Northern Nevada State's Young Careerist Award and represented Northern Nevada for the State Championship. Taking all of these invaluable experiences with her from Nevada in 1993, she moved to the San Francisco Bay Area and continued her career as an elementary teacher and teacher trainer in the San Rafael City Schools and the Reed School District in Tiburon, in Marin County, CA. She was awarded the prestigious Phoebe Hearst Educator of the Year Award in 1997. After eight years as an elementary teacher and staff developer, Kristen decided to enter the private sector. She had the opportunity to manage an Educational Resource Store that carried quality educational materials that were being utilized in the schools. She launched her tutorial business, A+ Creative Tutoring, in an office space in the back of the store with easy access to materials from the store. Kristen hired some of the finest educators in the area as tutors who shared her expertise, diverse background and experiences. Kristen's teaching philosophy was utilized in her practice and still today includes an approach that is based on developing the whole child's social, emotional and academic needs, while mastering their challenges and extending their strengths and knowledge. All of her tutoring programs are individualized and are offered in a variety of subject areas for students in second grade through college. She incorporates a variety of study skills involving time management, test taking, organization, note taking, and planning that builds self-confidence, motivation and preparation for a life-time of learning. Kristen is excited about her new endeavor as a college admissions consultant. She is now offering tutoring services in application and essay building, test taking and college matching services. She also continues her work as a private educational consultant to educators, administrators, and schools in various capacities. Most recently, she served as an educational coach to select teachers to facilitate a program from the San Francisco Exploratorium and San Francisco State University to implement engineering practices within the elementary school curriculum in mathematics and science. Kristen values her career as an educator and all the opportunities it has provided to her as an educational entrepreneur. She has been able to use her creative forces to launch several businesses and also maintain flexible hours to raise a family of three boys ages 17,15, and 13 with her husband, Steve.